There are some things that get burned in your psyche long before you realize its import. The black saree was one of them for me. I have always loved black as a color. So, when someone in the family purchased a black Mysore silk for her traditional baby shower (valai kaapu), it was etched in mind. The lustrous silk slipping and sliding between my fingers. It was the first saree I coveted. 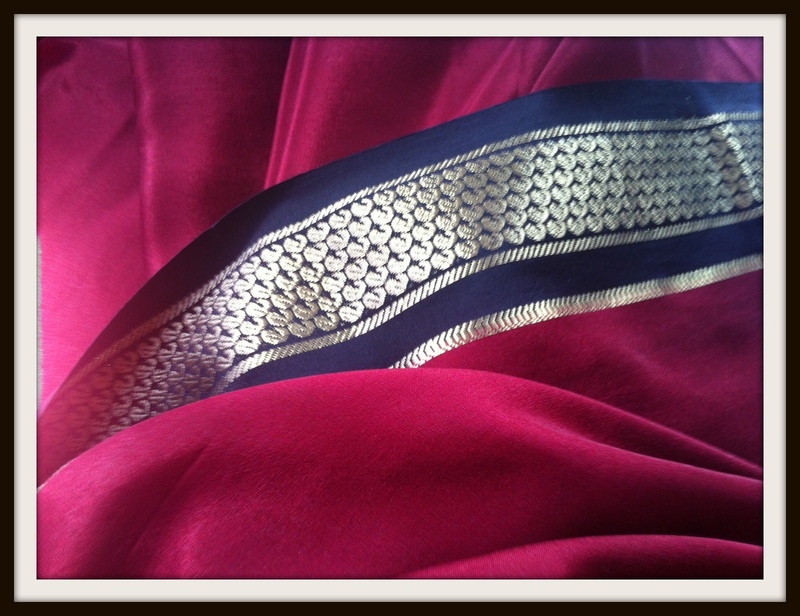 Curious, I looked through my mother’s sarees and found a black kancheevaram with temple tower border. A few years later, I got a silk salwar stitched from that saree. I wore it with gaudy gold jewelry at my cousin’s wedding. Over the years, I learned that the only occasion where a woman was permitted black was her valai kaapu. A ceremony celebrating life to be. A rite of passage that I secretly waited for. As dreams of pregnancy died out, the black saree eluded me. My children came home and I remember the only thing I asked my mom was a black Mysore silk. What I got instead was a crimson silk with a gorgeous black border. I felt upset. Upset and unable to explain what was lost to me that day. It haunted me. I could have bought one myself over the years or had Saathi to buy me one. But, I would not. I wanted the trappings that went with it. The tradition, the bangles, the celebration of womanhood it epitomized. So, when I set the date for my valai kaapu I dreamed of black sarees. Gorgeous and silky. Of all the things my mom brings with her this time, it will be the saree I will reach out for first. For it will represent a tangible proof of dreams coming true. With the date a week away, I realize the valai kaapu could be in jeopardy. Winter has been particularly harsh this year. Snow and ice are permanent fixtures around here. I look at the weather forecast. It shows 80% chance of snow and freezing rain. I sense a sinking feeling at the pit of my stomach. It’s just a ceremony I tell myself. Yet, a part of me hopes it will happen. That the forces will collude and keep bad weather at bay. Dreams have historically come true. Haven’t they? Dont worry – everything will go fine. I don’t really know you but all I want to do right now is to reach out and give you a hug. I am SO very happy for you.